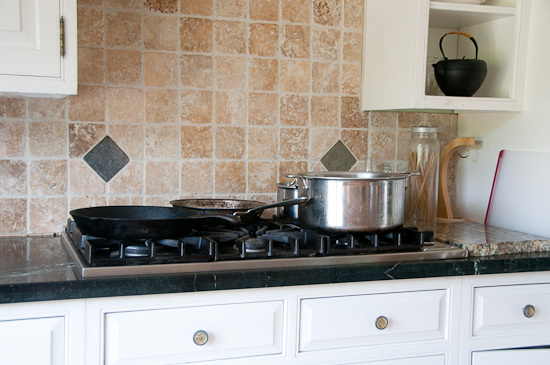 I thought I’d do something a little different for Eco-Friendly Friday this week, so I am giving you a glimpse into my kitchen. And the reason I am doing this is to show you that almost everything in here- cabinets, countertops, and appliances- is recycled. Really! I’ve never mentioned it here, but when I named my blog, it was not just because I espouse eco-friendly principles in my life and in my cooking. It was because my kitchen truly is green (it’s also painted green). 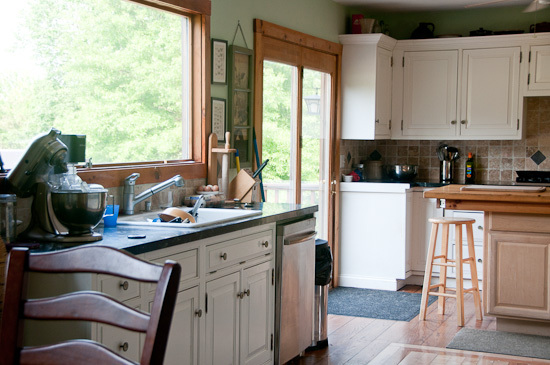 We moved to this house because we loved the property, but the kitchen was in really bad shape. 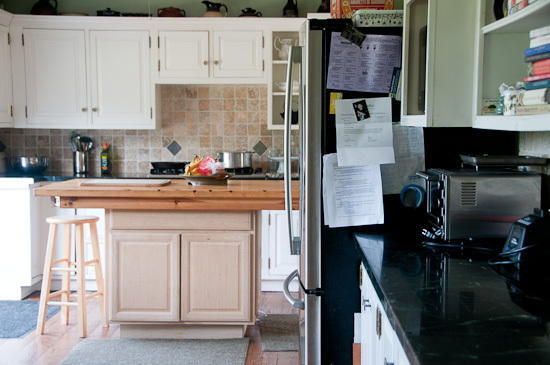 It was small with outdated appliances and little countertop space: not the right kitchen for someone who loves to cook, or for a family who uses the kitchen as the gathering place most of the time that we’re home. We wanted to re-do the whole thing, but the price of doing that with new materials? Forget it. So we found out about Green Demolitions, and we bought everything you see in our kitchen, except for the island and the refrigerator, from this great company. 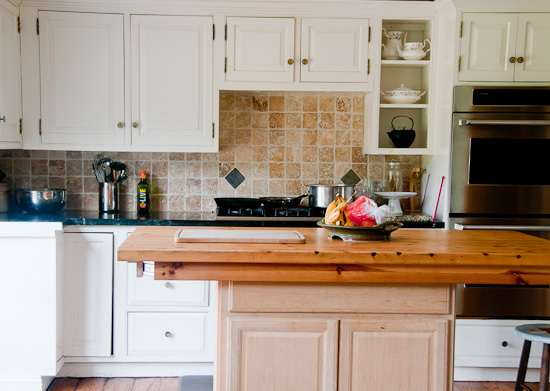 You might notice the top of the island is a little funky…that’s because we re-purposed an old tabletop. I don’t love the way it looks, but we’re using it as the island top because it’s huge and a fun place to work and eat family dinners. I won’t lie and say installing everything was simple. It wasn’t. It was quite adventure for our contractor, actually (as the kitchen we purchased was custom-made for a different house). But we got a great stuff and the price was amazing. Bosch dishwasher? Check. 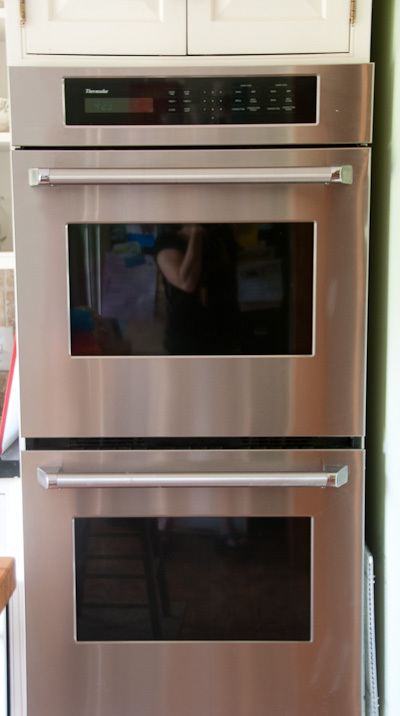 Thermador double oven? Check. Viking 6 burner cooktop? Check. High quality wood cabinets? Check. Granite countertops? Check. So whenever you’re doing any kind of renovation, don’t assume you have to buy new. Give some thought to to using recycled items. Resources like Green Demolitions, friends and family, estate sales, auctions, antique stores, yard sales, craigslist, and freecycle.org can all be sources of high quality used/recycled goods! Oh, thank you, Winnie – you inspire me NOT to give up on a search for a recycled Viking stove. Thanks for sharing your lovely kitchen!! Love that kitchen! We lucked out with the kitchen in our home, hardly anything needed to be done to make it perfect for us. But it’s good to hear recycled kitchens are doable. If we even want to update, I’ll definitely look into that! What a lovely kitchen, Winnie! It looks like you have a nice view too. I love seeing peoples kitchens! Only yesterday I overheard a conversation where someone saying how they bought their kitchen from someone who was getting a new one. Wow, thank you so much for this post! I don’t usually speak up around here, but I always enjoy the recipes you post, and this entry was so refreshing, too. Apparently Green Demolitions actually has a location near my family’s vacation home, and I never knew it! From the website, it reminds me a lot of these Habitat for Humanity “Re-Stores” that I was recently introduced to and love. I’ll have to check Green Demolitions out the next time I’m in that area! Thanks for sharing… I wonder if they have other smaller kitchen appliances? Hi Winnie! We are not redoing our kitchen any time soon, but I will not forget this eco-friendly re-do if we have the ability to upgrade. Such a great idea and your kitchen is fabulous! 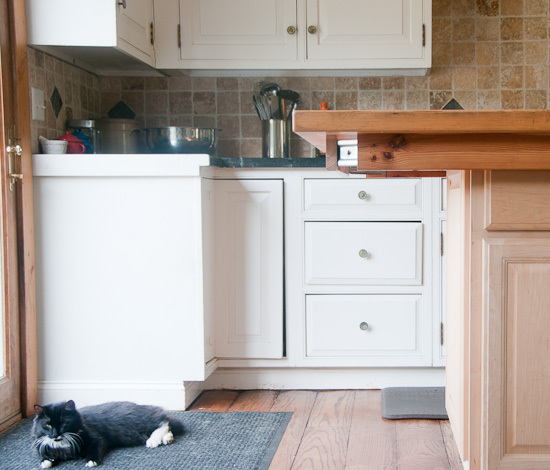 INSANELY envious of your kitchen Winnie. I am coming to live with you. I love your kitchen! I can’t wait to have lunch! Your kitchen is absolutely stunning! And I love that it is all green and you used so many re-purposed materials. Kudos! I envy your space and appliances…some day! Your kitchen is beautiful! We moved into an old farm house (renting) and no one lived there since the 70′s YIKES! and the current owners had an auction and sold anything worth ANY money. So we only had 1 row of lower cabinets with a gross top and a stainless sink. We got all of our kitchen cabinets and counters at restore, like someone mentioned above. It’s a great place. Here’s the link http://www.habitat.org/restores/ probably like the place you went merchandise comes and goes so it can be hit or miss but sometimes you get lucky if you keep looking. Your kitchen is beautiful. I love how you put it together. To tie the island together with the rest of the room, you could paint the whole thing the same green as the walls, or paint the bottom part a dark grey like the granite countertops. You could still leave that nice wood on the top surface that shows up so nicely in your pics.